It takes little to convince me that Alex Beyrodt (Sinner, Silent Force, Scheepers, et al) is one of our greatest 'classic' contempoary guitarists. This fellow keeps growing and stretching his capabilities, aa his second release for his Voodoo Circle project Broken Heart Syndrome clearly demonstrates. Working from a base of well establish neo-classical rock and metal guitar technique from past to present, Broken Heart Syndrome reveals a touch of Beyrodt's blues influence. As Keith Richard once said: "If you don't know the blues ... there's no point in picking up the guitar and playing rock and roll ..." Beyrodt brings this important motif to the harder melodic rock of Broken Heart Syndrome. No Solution Blues, Broken Heart Syndrome, and When Destiny Calls are some of the best cuts indicative of this influence. Coupled with David Readman's strong vocals (and some of best recent work) you have a blistering set equivalent to what Coverdale and Whitesnake attempted in the early Eighties. 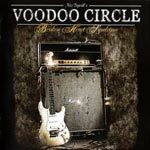 But rather than suggesting some comparison, Voodoo Circle breathes life and inspiration into the modern integration of blues with hard rock and metal. While blues can suggest both severe and melancholoy emotions, it can also be deliberately soulful. The song Blind Man finds Voodoo Circle, especially Beyrodt and Readman, at their soulful best. (Dig that old school Hammond sound, too.) But all these influences can blend into a pure galloping rock number as on Heal My Pain or The Heavens Are Burning. Ultimately, even with the expected emphasis on Alex's impressive guitar licks, this man know the importance of crafting a good song. Guitar prima donna's be damned: Beyrodt is both leader of the band and player in the band in the best fashion. Like the Voodoo Circle debut Broken Heart Syndrome is nearly flawless. Alex Beyrodt delivers the goods: guitar driven melodic hard rock with a certain touch of the blues. Strongly recommended.